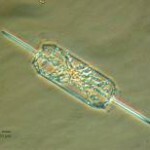 The marine dinoflagellate, Noctiluca scintillians, Barra Beach, Mozambique. 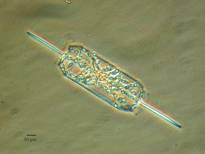 This project is directed towards the creation of a detailed image and taxonomic database of the phytoplankton- particularly diatoms- of the Trincomali Channel, Southern Gulf Islands, British Columbia. It commenced in 2004. Mark Webber’s light microscope (LM) and scanning electron microscope (SEM) images, numbering in the thousands, can be found at the University of British Columbia’s Biomedia Image and Movie Database. The UBC Biomedia website also includes other contributors’ excellent collections of biological microscopic images. Webber’s images, which include phytoplankton and some zooplankton from other localities, are being added to the Biomedia website on a regular basis. The collections are taxonomically organized, briefly described with references cited, the locale given as well as the method of preparation and the imaging equipment used. Wherever possible, identifications are made to the genus and species levels. Mr. Webber collaborates with specialists worldwide to obtain and lend assistance to the process of making accurate identifications. The Biomedia database is designed to provide Cell Biology students with a large number of images and movies of cell structure from a wide variety of cell types. The images and movies have been generated using high quality light microscopes, transmission electron microscopes (TEMs) and scanning electron microscopes, such as the ones found in the U.B.C. BioImaging Facility. Many thanks to Dr. Lacey Samuels (UBC BioMedia site), Department of Botany at UBC, Garnet Martins (Research Manager, UBC BioImaging Facility) and Derrick Horn (EM Technician) for ongoing assistance in this project. Also, thanks to Dr. Ellen Rosenberg, Department of Botany, and all the fine technicians at the BioImaging Facility. A collaboration with UBC’s Canadian Centre for the Culture of Microorganisms (CCCM) and the kind assistance of Donna Dinh offers reliable cell cultures for investigations by Mark Webber and other researchers. Recent work at the University of Victoria, BC has been in collaboration with Dr. Elaine Humphrey at the Advanced Microscope Facility and studies in New Zealand have been greatly assisted by Ms. Liz Girvan at the Otago Centre for Electron Microscopy, Otago School of Medical Sciences, University of Otago, Dunedin, as well as Mr. Neil Andrews, Dr. David Collings and Mr. Manfred Ingerfeld at the University of Canterbury, Department of Biological Sciences, Christchurch. A robust D. brightwellii cell, just before vegetative division, Trincomali Channel, BC. SEM of D. brightwellii, Trincomali Channel, BC. 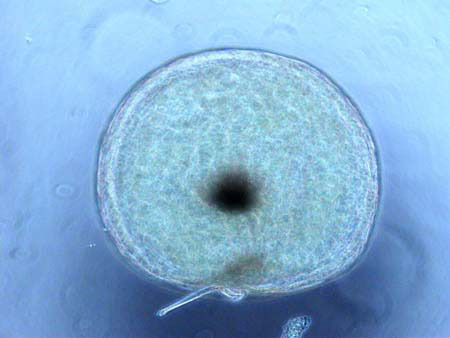 Commencing in 2006 with a survey of this diatom’s distribution around the coastline of the South Island of New Zealand, this project has diverged into two areas of research. The first of these is the pursuit of understanding the “patchy” distribution observed in this cosmopolitan species both geographically and temporally. Arising out of the above survey, in the last four years the primary focus of study has been on the in situ physiologic stress of D. brightwellii. Investigation of the morphological and biochemical changes attributed to stress have been neglected in the literature and sometimes confused with such life-stages as auxosporulation, resting cell and resting spore formation.Our current research project aims to answer the question as to what causes stress and recovery of D. brightwellii, and whether in fact cycles of high percentages of stress in an in situ population is a normal life-stage and adaptive strategy. Studies of the natural life cycle and the question of physiologic stress in D. brightwellii are ongoing, when time allows, both at Akaroa Harbour in New Zealand and the Trincomali Channel, Galiano Island, British Columbia, Canada. In New Zealand, these auto-ecological studies have been assisted by Dr. Paul Broady, Algae Lab, Department of Biological Sciences, University of Canterbury, Christchurch. Status: A series of papers on the physiologic stress of D. brightwellii are in draft form. with Elaine Humphrey, Advanced Microscope Facility, University of Victoria and Jamie van Dam. Stressed cell of D. brightwellii, Akaroa Harbour, New Zealand. Stressed cell of D. brightwellii, Trincomali Channel, BC. Mr. Webber has several microscopes which are used in his investigations. These include a Swift Portable field microscope FM-31 (phase contrast), a Leica Stereo-microscope GZ 6T as well as Leitz Dialux and Diavert light microscopes. Images are currently acquired with a Canon Rebel Ti1 15 Megapixel camera with Martin Microscope adapter, where a Nikon Coolpix 4500 was previously used. While in New Zealand the loan of an Olympus CK-40 inverted microscope, by Duncan Gray and Simon Egan, has been of great assistance. Both 20 and 60 micron plankton nets are used for gathering marine and freshwater samples. 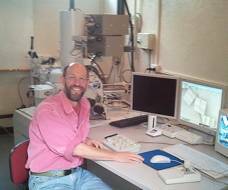 Starting in 2003, images unless SEM are of fresh, unstained non-preserved organisms and were taken by Mark Webber unless indicated. Any suggestions, corrections or comments about identifications are very welcome. Lama Mark using the Scanning Electron Microscope. The following is a quote by the eminent entomologist and naturalist Thomas Eisner; a gem of prose that Mark believes encapsulates the joyous spirit of the investigative mind. “I found out later that there is nothing new about these observations. Others had made them years earlier. There is a saying that “5 minutes in the library can save you weeks in the laboratory,” which has considerable merit. I prefer the naturalist’s version, which says that “weeks in the field can save you minutes in the library.” But be that as it may, it does pay to check the literature before yielding to the assumption that a given observation is a genuine discovery. This exercise does not detract from the sheer joy you experience when you learn something from nature that you didn’t know before. Finding out later that your “discovery” was no discovery at all in no way diminishes the pleasure of the recollection. There are countless observations that I made that turned out later to be “old hat.” What I remember about these observations is the pleasure of experiencing them, not how I reacted when I discovered the published accounts. The naturalist explorer need not always be a pioneer. To discover for yourself what is already known can still be a source of wonder–which is why the study of nature can never disappoint. —Albert Einstein, (Suspected to be from) Ideas and Opinions (soon to be confirmed). LM of a chain of Thalassiosira rotula cells (from a culture). SEM image of Thalassiosira rotula cells showing chitin strands connecting cells via the central processes. 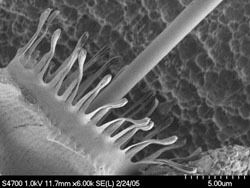 SEM image of the central strutted processes on the valve face of Thalassiosira rotula.